Dee vibe Mon, eets about dee vibe. Squawk: This place is one of the many “Kingly Court” open air eateries and a great destination if you’re hungry and don’t know what you’re in the mood for, but of course, you do know don’t you? That’s why you’re here and why you should probably join up and start submitting some chicken burger reviews of your own, but we digress. Lots of other options out there. 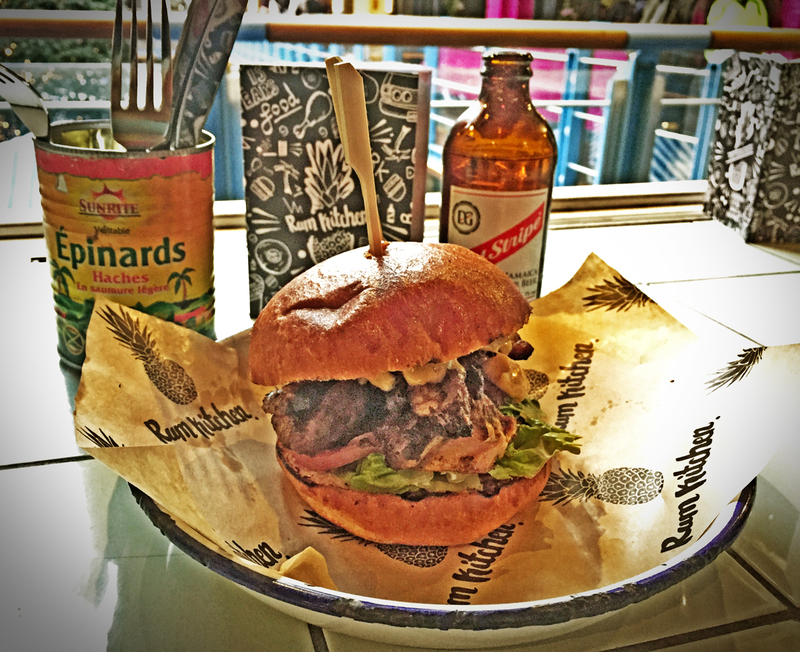 The Twist Burger is a Jamaican jerk chicken burger served with tomato, lettuce, hoisin mayo & Sriracha and comes on its own. All sides are extra. Even fries, which is a bad idea “mon.” The chicken is perfect combo of chewy and crspy without the sinewy strings of “nature’s dental floss” we’ve found on other Jerk burgers in the past. The spice is nice although not as long lasting as we would have liked. Presentation is solid. We like the decor, the music and the overall vibe. And we noted their.custom printed bowl/plate liners and their very nicely printed 43 page drinks menu (the food menu is one page, so we know where their priorities lie – which reminds us, we always love those mini bottles of Red Stripe Beer, we call them “Jamaican hand grenades.” Details like the tin can cutlery holders added an authentic touch. Buaawk: Service while friendly, was, as is expected in this part of the world, terrible. Our burger came first. Then our beer. Then our cutlery/napkins. And then, finally, they asked us if we wanted water, to which we replied “yes,” and instead they brought us a candle. When we asked for extra hot sauce we got Sriracha. Not sure what part of Jamaica that’s from. It works, but that’s because Sriracha is a universally friendly, non discriminatory sauce, and not due to any observable kitchen intellgience.